So here’s the good news: I finally got a BlackBerry. And here’s the not-so-good news, I will be only using it for a couple of months, and I think I’m already falling for it. I have a thing for qwerty keypads, more so than touchscreens, so when SingTel offered to loan me a BlackBerry Bold 9700 smartphone handset for a couple of months, I said YES with a big exclamation mark! Girls get a thrill opening a little blue box, I got mine opening the little black box. I could feel the same excitement when I first laid my hands on my Dslr. I felt like a kid on Christmas Eve again, you know the feeling of sitting beside the Christmas tree to unwrap the xmas present. I need to know, I want to know what is inside the black box! It didn’t help that I was surrounded by a group of friends who are all BlackBerry users. Foreign terms like BBM (BlackBerry messaging), barcode (for scanning your BlackBerry pin), trackpad were mentioned. Needless to say, I didn’t understand half of it. Every BlackBerry handset has its unique barcode. My friend grabbed my BlackBerry and added me on BlackBerry Messenger by scanning the BlackBerry BarCode – it was like magic! Okay, I decided. I WILL NOT fall in love with the BlackBerry, not when I am just using it for a few months. Fast forward a few hours, I was forced to be familiar with the BlackBerry as my phone decided to act cranky and gave me problems. Talk about jealousy at the right moment. Long story short, I really hate to say this. But the BlackBerry is seriously addictive. Every thing is so intuitive, and the best part (or function) is definitely the BlackBerry Messager (BBM). It allows you to communicate with all your friends instantly; it’s like msn on-the-go and the group chat makes it even better! My clique has created a BlackBerry Messenger Group called “One Month” in their attempt to psych and convert me into a BlackBerry lover. But I have to admit, the BlackBerry group chat is really addictive! It allows me to chat with my group of friends and is really useful to kill travelling time. Another feature of the BlackBerry that I have been using is the Internet browser. Surfing on the BlackBerry is really fast and I have been using it to check my blog and moderate the new comments. The quality of music on my BlackBerry is competent and I have been using the phone to double up as a media player ever since my mp3 player died on me. Transferring the music soundtrack to the BlackBerry is effortless, and I am probably not going to get a new mp3 player now that I have a BlackBerry. 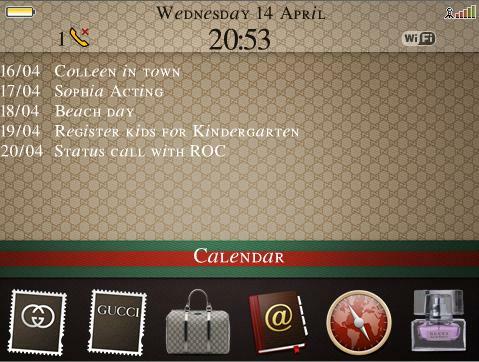 Meanwhile, I was getting a bit bored with the original BlackBerry theme, so I downloaded a free Gucci Theme for my BlackBerry Bold 9700 from PocketBerry. The more I play with the BlackBerry, the harder it is not to want one. You will probably not want to hear me raving about the push mail, Twitter on BlackBerry and all the other functions. Like all the other BlackBerry users, I can go on and on all day talking about everything in the phone. If you have never used a BlackBerry before, it’s time to get one and see what you are missing out. Like what the BlackBerry users say, your life will never be the same again. OH NO! I think it’s a mistake to accept the handset for even awhile! What is going to happen to me after I return the BlackBerry? I totally want to get a new BlackBerry and sign up for the SingTel Youth BlackBerry Flexi Plan now! Initially I was quite confused by all the different plans, but after finding out more about the details, it’s actually very simple. Before there was the SingTel Youth BlackBerry Flexi plan, all the users need to sign up for their usual mobile plan, plus an additional BlackBerry Internet Service (bis) at $24.90/month for 3GB. But with the new SingTel Youth BlackBerry Flexi Plan (applicable to students & NSF), you only need to pay $48/month, which includes 100 min outgoing talktime, unlimited sms, free incoming calls, and 15 GB of local data usage. The 15GB is almost impossible to exceed as BlackBerry provides file compression on emails and HTML pages! To sign up for the SingTel Youth BlackBerry Flexi Plan, please visit any SingTel shop or www.singtel.com/youth for more details. Okay, I think I want need a BlackBerry Bold 9700 now! Thanks for the advert! Is there a need to pay for the phone too? Of cos you should go get a BB now! Awesome resolution too! I too was once a crackberry addict but I have gone to the dark side and am now an iphone user. I do miss the real keyboard and the better e-mail system but overall I am pleased with my switch! You are now a crackhead. Hahaha. I still think the iPhone is better in many areas. iPhone 4 is gonna beat the blackberry hands-down in many many aspects. Qwerty keypad truly facilitates communication – touch screen seemed to cause heaps of typos in my friend’s messages making them look very unprofessional if it’s used in a more professional capacity! Just my two cents! kaelyn: it depends on which plan you sign on? hahazz: Soon, soon i will get my own blackberry! dweam: hello my fellow crackhead! poundcake: oh dear, you also switched to the white side? haha are u gonna get the new iphone 4G? Nooo turn to the iPhone side!! iPhone beats, no, bodyslams the Blackberry until it’s a blue-and-black squashedberry! It took you two months to fall in love with the BB. But with the iPhone, it’s immediate. You’ll not only fall in love, you’ll be faithful for life. what do you mean by you have to return it? Does that mean that if i sign up for the youth plan, i gotta return the phone? And do i have to pay extra for the phone after signing up for the plan? which blackberry is best for a teenager? If you sign up for the singtel youth flexi plan, how much does the device cost? Is the plan includes 2 years of contract?